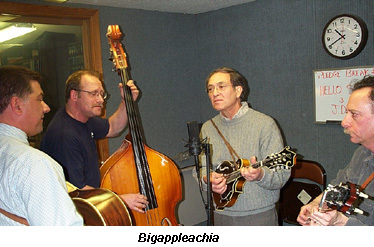 Big Appleachia’s mission is “to bring the simplicity of a bygone era … to the uninitiated urban audience of the present” and, boy, these guys sure can pick and sing great bluegrass and old-time mountain music. We spent some 75 minutes with them Live in Studio A as they ripped through a fine selection of songs ranging from the Stanley Brothers to Buzz Busby and talked about their musical careers and their now one-year-old group. 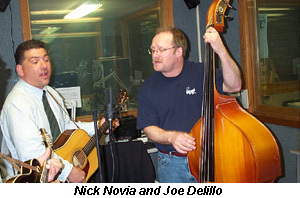 Big Appleachia is Nick Novia on guitar and vocals; Andrew Cartoun (aka Stony Lonesome) on banjo; Bob Mavian on mandolin; Joe DeLillo on bass, and Pete Elegant on fiddle. Pete couldn’t make the trip up to the WSHU studios from New York City because of a work commitment. A big tip of the hat to Abe Lettelleir, WSHU’s assistant engineer, who mixed the sound for the live portion of the show. 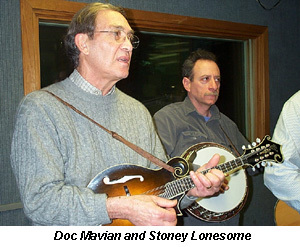 We finished up the show with selections from new albums from James Reams and Walter Hensley and Lynn Morris and a few cuts of classic bluegrass from Smithsonian/Folkways. Keep Lynn Morris in your thoughts and prayers. She recently suffered a stroke and is on the road to recovery.